Adding a regular exercise program to your curriculum is an excellent way to help participants cope with their disabilities. Our classes are designed and modified to address the specific needs of your group. This strength and conditioning class is designed to offer a variety of exercise routines to increase cardiovascular endurance, balance and overall strength and muscle development for the participants. Participants use resistance bands, light weights, balance balls and medicine balls for an enhanced workout. Our energetic instructors and music keep everyone moving! Instructors work with participants to modify routines and to adapt specific exercises to meet the needs and abilities of individual participants. Exercises are simple and can be repeated outside of class. Yoga is the ancient discipline of personal development that balances body, mind, and spirit. Yoga fitness classes are beneficial for individuals with disabilities or chronic health conditions through both the physical postures and breathing work. Our Yoga instructors teach modified physical postures as well as practical methods for relaxation, proper breathing, meditation, and concentration that promote health, alleviate stress, improve skeletal alignment, and increase muscular strength and flexibility. Our Drums! Class combines a variety of music, movement and rhythm therapy and allows the participants to feel connected to a group and express themselves in a constructive, non-verbal and fun way! This fitness class “rocks” while improving cardiovascular fitness and developing upper body strength. Each participant works with a set of drum sticks and a balance ball. Dance therapy is the therapeutic use of movement to improve the mental and physical well being of a person. It focuses on the connection between the mind and body to promote health and happiness. Participants with physical deficits are able to relax, while learning balance and coordination. Our therapeutic dance class includes total body movement to enhance the functions of body systems, such as the circulatory, respiratory, skeletal, and muscular systems. The emphasis in dance therapy is on free movement, not restrictive steps, and expressing one's true emotions. Our instructors and participants use various props to enhance the experience. Exercise benefits people of all ages and abilities! This class focuses on helping participants have greater energy, stronger muscles, better balance, flexibility, and a happy and alert mind! Our instructors insure an exercise routine that is safe for all, providing modified exercises which increase the heart rate, while addressing the abilities of each participant. Wheelchair participants are encouraged to attend. 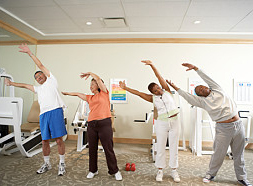 We can build any fitness class to address your group’s needs and preferences.